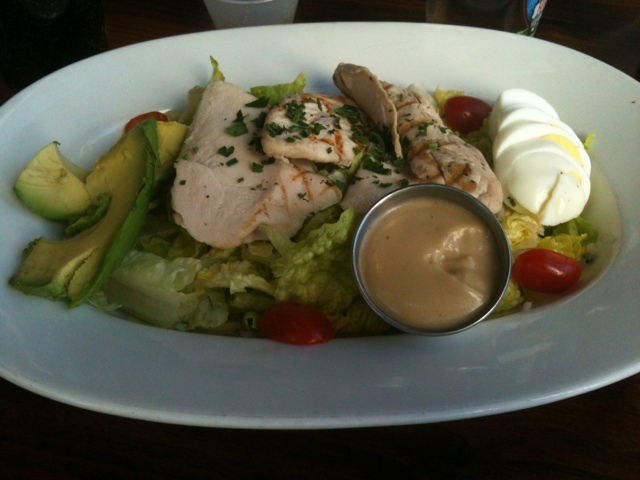 The egg and the tuna make it a great choice. Surrounded by Dairy Queen, Italian Kitchen, Subway (all those carbs! ), China Wok, Baja Bistro and The Great American Cookie Co.
At least the sandwich is turkey, the pita chips are baked and the lentils are protein. It could be worse. 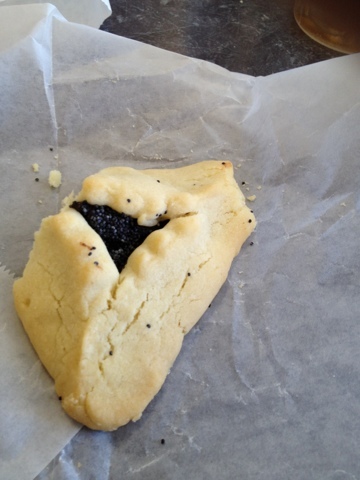 My excuse: Living in Atlanta, I don’t get to real Jewish delis very often, and I love these hammentashen poppyseed cookies. I admit I had to ask the clerk at the Bagel Palace Deli & Bakery to spell the name so i could write this post. I probably more aware of Jewish culture than many non-Jews. I studied Holocaust literature and even stumbled into pledging the traditionally Jewish Sigma Alpha Mu in college. From my fraternity brothers, I learned to swear in Yiddish, appreciate the Jewish girls in the little sisters auxiliary (before I owned up to my preference for men) and bake bread by making challah. For Jews and Italians, it’s all about the family and food. Even when it’s somewhat warped. I swear: If you eliminated that little disagreement over Jesus Christ, Jews and Italians would be one culture. I’m old enough to remember when turkey was a once a year thing, served only on Thanksgiving. If we had meat on a sandwich when I was a kid it was bologna, salami, ham, the incredibly tanned and bland olive loaf(!) or Spam. Fried, of course. 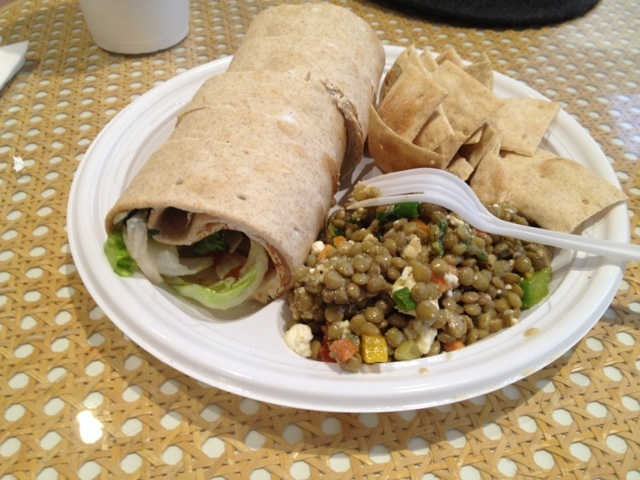 Then sometime around the time I was in college, turkey blossomed as an every day food. Now I’m not sure what I’d do without it. I buy two pounds of Boarshead low sodium turkey breast or chicken breast deli meat a week. If it doesn’t wind up in a sandwich, I eat it straight out of the package. On the Weight Watchers Simply Filling food plan, you don’t even have to track the precise amount of lean proteins you eat. 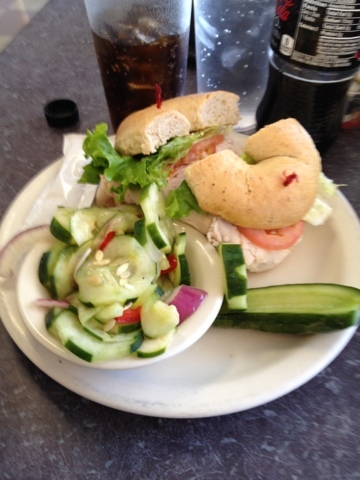 Admittedly, the turkey sandwich can get old. In my 30s, I remember losing a ton of weight on a diet that consisted of a cold turkey sandwich and baby carrots every day for lunch. Then at night — after 45 minutes on the Stairmaster — I’d have another turkey sandwich, this time grilled with no-fat cheese and a microwaved baked potato. No wonder that didn’t last. Today, I eat fewer turkey sandwiches. But like a lot of folks watching their weight, it’s a staple. We’d starve if it wasn’t on most menus. It’s something to be thankful for the other 364 days of the year. After a day of eating too many biscotti on a visit to my family in suburban Detroit, it was time to buckle down to lean protein and vegetables. 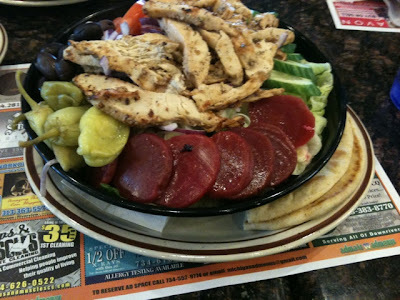 So when we got to Wild Coney, I went for the large Greek salad, dressing and feta on the side, of course. The menu wasn’t kidding when it said large. Boy I wish the dressing were thinner and easier to spread. I could use less. But it does look good. Leaving off the bacon was a good idea. Chik-fil-A‘s got a new multi-grain oatmeal that provides at least a decent alternative to that bundle of fat and sodium called a chicken biscuit. 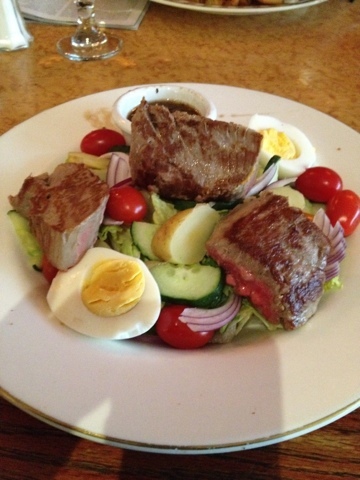 Without the toppings, an 8-ounce serving is 120 calories, 3 grams fat, 21 grams carbs and 4 grams protein. With topping, it climbs to 280 calories, 11 g fat, 44 g carbs, and 6 g protein. The toppings are cinnamon brown sugar, nuts and dried fruit. The food in chain restaurant commercials is seductive. It is sun-soaked, or at least artificially lighted within an inch of its life to look so. It’s wet, dripping with the water of vegetables freshly picked and washed. And it is shiny. It glistens in that faux sunlight like the screen of a brand new iPad, just loosened from its pristine white box. The mouth waters. 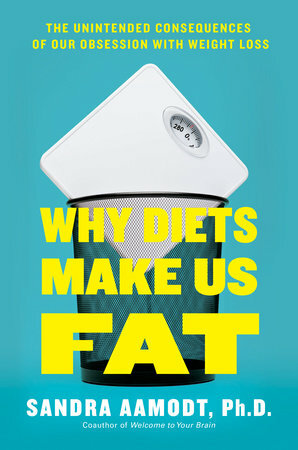 And all that sheen adds up to…fat. Whether it’s butter or the cheapest canola oil available, restaurant food often arrives at the table with a veneer of fat. Often it’s more than a mere veneer. A piece of fish can easily have a whole tablespoon of fat clinging to it on all sides. With olive oil, that’s 119 calories and 14 grams of fat. There’s even a thin sheen when you’ve asked for it to be grilled without fat, picked up from residue on the grill itself. On Weight Watchers, this presents a question: How to account for an undetermined amount of shine. A Weight Watchers leader told me she follows a simple rule: 1 point if its a thin sheen and 2 if it looks properly shellacked. In my loss of 50 pounds, I followed this rule scrupulously. At a Mexican restaurant, for example, chicken or shrimp fajitas, especially if eaten with higher-fiber corn tortillas, are a good option. But they often arrive at the table sizzling in the grease. I’ve taken to telling the server: “Please ask the kitchen to take it out of whatever it’s marinating in, run it under some water and then throw it on the grill.” Try it sometime. The waiter may pretend to be confused, like you’re speaking in Chinese or something, and it may well come out dripping anyway. But you can always send it back, and I have. The resulting dish doesn’t suffer in flavor in the least. So I was a little dubious recently when I stopped for another Whole Paycheck salad and saw on the salad bar a bottle of shiny brown liquid that purported to be no-fat balsamic dressing. Such items don’t have to carry nutritional labeling, so one has to take it on faith. The ingredients were water, balsamic vinegar, tamari, Dijon mustard, nutritional yeast, onion powder, rosemary, thyme and garlic. Nutritional yeast carries a small amount of fat, which may account for the shine, but very little. 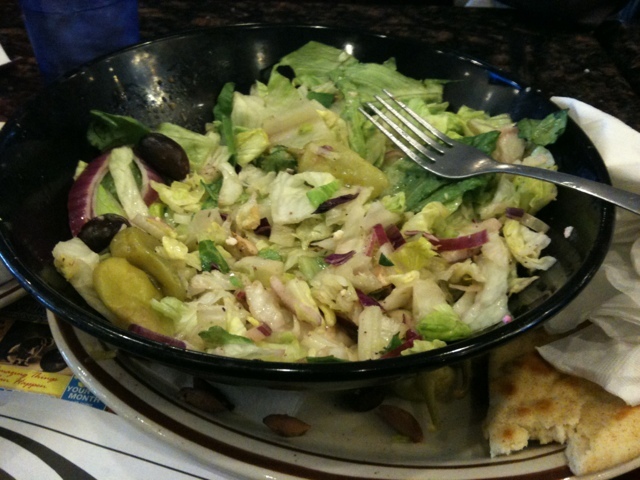 Lacking oil, it didn’t spread through the salad the way an oily dressing does. It didn’t have the silky flavor of a first-class balsamic dressing, but on the other hand, it was fine. Chalk one up for nutritional yeast. Anyone have a recipe to replicate this dressing at home?